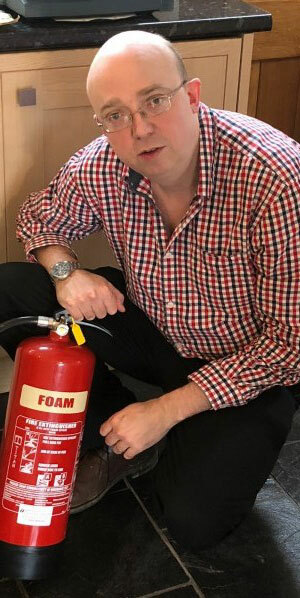 A SHROPSHIRE and POWYS accountant is urging the public to back a campaign to scrap VAT on fire safety products. Rob Ellis, Welch and Ellis Accounting in Oswestry, is throwing his support behind the Axe Safety Tax campaign, launched by company Gas Tag as he believes it is wrong to charge VAT on products designed to save lives. He thinks the tax is unfair to most small-scale landlords who may only own one or two properties, often bought to provide them with a pension or inherited after the death of a family member. The campaign is calling for the Government to scrap the 20 per cent tax which is added to a range of products and services included fire alarms, carbon monoxide detectors, gas safety checks, fire doors and extinguishers. Central to the campaign is the belief adding VAT to the products is not only a blow for small landlords and agents, it puts the public at greater risk as it is becoming increasingly expensive to ensure rental properties are compliant. In addition, these products are also bought by people to keep their own homes safe. He feels it is especially important for landlords as they can face fines and even imprisonment for failing to conduct gas safety checks and not providing smoke and carbon monoxide alarms or ensuring furniture is fire-safe. Rob who runs a firm helping small businesses with their book keeping and accountancy needs says he is well placed to understand the importance of tax and why we need to pay it. But adding VAT to these products at best makes no sense and at worst could prove dangerous. Now Rob is urging people to sign a petition to call for the VAT to be scrapped, which has been set up on the Parliament website.